Triathlon is a sport made up of 4 different events. Yes, I said 4; swim, bike, run and transition. 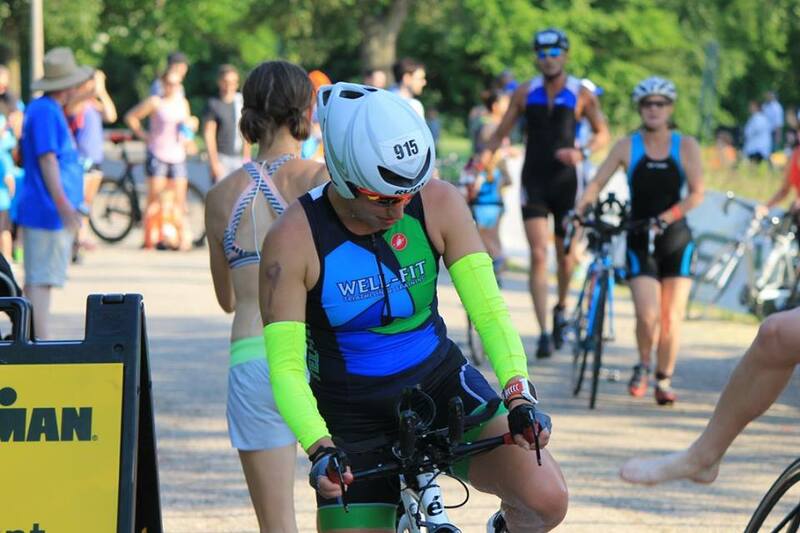 Experienced triathletes, especially those who specialize in short course racing, will tell you that your transition time can be the determining factor in achieving your goal time. The good news about this “fourth” element is that you can be as fast as the pros on day one. All it takes is a little organization and practice. With more than 25 years in the sport, I have transition down to a science. Here is my process that has helped thousands of athletes cut their transition time in half. Use our Race Day Checklist. Get to the transition area early. Check the pressure in your bike tires before going to transition. Don’t use Vaseline if you are wearing a wet suit – it’s bad for the neoprene. If you don’t have Runner’s Lube or Body Glide, or something similar, Pam works in a pinch. Bike helmets are often inspected upon entrance to the transition. If provided, have your race numbers on the bike handlebars and bike helmet. Many people like to mark their bike location with a balloon or some type of flag. If you don’t have one, put your bike next to someone who does. Trees can also serve this purpose or tie a bandana to the rack. The bike racks can be l-o-n-g. Think about where to set up. Closer to the swim in means the less you have to run from the swim and out on the run, but longer you have to go in and out with your bike. Closer to the bike exit means longer swim in and run out run, but less you have to go with your bike. Put your bike in a low gear. Bring a large beach towel to put down next to your bike. If you have a unique one, it can help you locate your bike – assuming you run down the right rack. On the towel, going from the back of the bike to the front, lay out your bike gear closest to you and the run gear closest to the rack. Open up your bike shoes and running shoes by loosening the straps/laces. IF you are comfortable putting on your bike shoes while riding (and don’t wear socks), secure them horizontally on the pedals with rubber bands. Roll down your socks to the ankle – makes them easier to get on. Unbuckle the bike helmet strap, put the straps over the side, and put the helmet on your handlebars (if it will safely stay there). Undo your bike gloves and put in the helmet. Sit your sunglasses, open, on top of the gloves. Open zippers of all clothing. When you come out of the water, unzip your wetsuit and pull it down to your waist. This helps prevent overheating. Take off your goggles and swim cap immediately on exit. Some people prefer to take the wetsuit off completely at the swim exit. If you do this, move out of everyone’s way. 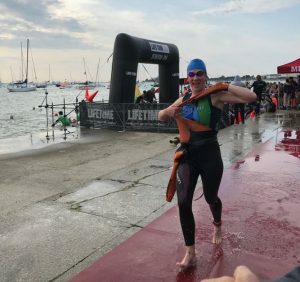 If you are worried about your feet, have a friend at the swim exit (or up the path a ways) hand you a pair of sandals or flip-flops to wear up to the transition area. Pull your wetsuit off inside out. Put it down on your towel out of the way, under the rack. Don’t worry about folding it; you can do that after the race. Put on shorts, shirt, socks, shoes. Put on sunglasses, bike gloves, then put on your helmet and fasten it. Grab our bike off the rack and head toward the exit. NOTE: Helmet on and fastened before unracking your bike! Run to the bike exit using a seat carry — hold onto the back of the seat and steer the bike by leaning it. Practice this before the race! When you are coming towards the end of the bike course, shift to a lower gear and pedal faster (higher cadence). This helps prepare your legs for the run. Dismount in the designated area; you cannot ride into the transition area. Keep your helmet on and buckled until you rack your bike. Jog easily with your bike to find your stuff, using the seat carry. Your legs will probably feel like they’re made of stone. It’ll get better when you get out onto the run. Put your running shoes on first. This way you can grab the other stuff (hat, gels, etc.) and put them on as you head toward the exit. Hopefully these tips and tricks will help you master the 4th element of Triathlon. Good luck!